The Miller Manyard™ lanyard is unsurpassed for safety,comfort and mobility. The Miller Manyard™ lanyard is unique. The energy absorber is not external but is woven through the entire length of the lanyard. Unlike conventional energy absorbing lanyards, there is no tearing action when a fall is taken, but a smooth expansion of the core material minimising the fall force to under 6kN. A warning label indicates to the user that a fall has been sustained and that the lanyard should be removed from service. 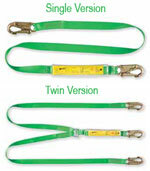 The bright webbing colour of the Manyard lanyard allows easier inspection of worker compliance and correct use. One of the AS/NZS 1891.1 - 2007 changes is to Appendix H, to now include tests which simulate a type of misuse of double lanyards. Lanyards with a single energy absorber remain unaffected by these improved testing requirements. The Manyard lanyard is unsurpassed in the market for safety, comfort and mobility. Specially woven shock absorbing inner core reduces fall forces. No energy absorber "pack" makes it more comfortable to use. Heavy duty tubular outer sleeve serves as a back up lanyard. Unique warning flag provides visual proof of a sustained fall. Grid label allows easy recording of inspection dates. 35mm polyester webbing with integral compact energy absorber. 19mm double acting hooks each end. 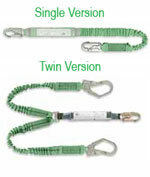 A unique stretchable lanyard design that minimises the length of the lanyard preventing tripping or snagging. Elastic inner core contains the unextended length of webbing. Outer load bearing tubular polyester webbing. Reliable visual inspection if a fall has been taken. Levitator adjustable lanyards offer unique versatility whilst working at height. Patented design with printed increments every 200mm. Easy to adjust and see the working length of the lanyard. Brightly coloured webbing which increases worker visibility. A choice of lanyard terminations enables greater worker flexibility. Flame retardant Kevlar© and Nomex© webbing. 19mm double acting hooks at each end. Perfect for working in heat or with hot sparks. Lightweight type 2 fall arrestor. EN360 certified (AS/NZS 1891.3 compliant). Swivel hook at bottom and karabiner at top. High impact flexible outer casing. 11mm plastic coated galvanised wire. A revolutionary hook allowing the lanyard to tie back onto itself. Tie back hooks will withstand forces of up to 22kN at any angle. Provides greater flexibility on site with less set up time.